The seat racing continues. We are all tired, wet and sore. Some guys feel sick and yep, someone just threw-up over the side of the boat. Welcome to college rowing where you spend the entire school year in preparation for a few sprint races in late Spring. It is said for college athletes, the ratio of practice hours to actual competition time is highest for rowing. It is not just a sport, rowing becomes a way of life. To this day one of my life joys was rowing; the endless practice time on the water and the competition itself. I started this post with a memory of seat racing. What is seat racing? It is a process to fine-tune the boat of eight oarsmen. After all the hours of practice it is time to choose who makes the top boat. Rowing is as old-school as it gets. There are varsity, junior-varsity, and Freshman crews. You do not see that in other college sports. Rowers love the history of the sport and the continuation of the traditions. One such tradition is the seat race process. With seat racing you race two boats against each other and then switch out individual crew members. Again you race. Then switch one or more rowers. Yet another race. It is not a crew vs. another crew. 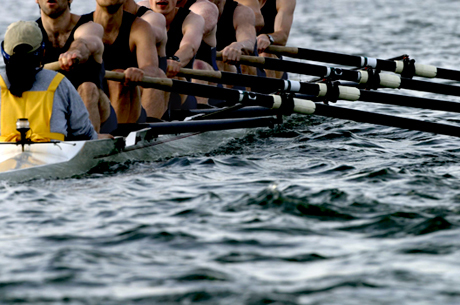 It is individuals rowing against each other. Why do we have seat racing? The coach should know his best crew by then – you have rowed together for months in different combinations. It is not that simple. There is something amazing about a great crew. It is a team – eight people moving together as one. Yet it is hard to gauge how well a boat will perform until it is on the water racing for victory. There is the simple math of adding together individual physical ability, but something more too. The best crews have a spirit that can not be defined, only witnessed. What is the best mix of eight men or women to define that spirit and make the boat move fast? That is what seat racing does. We switch out the parts until the best, most spirited, and fast boat is discovered. From my experience, magic happens during seat races. Individuals that you do not expect to perform help the boat move fast. Others who we expected to move the boat fast, do not add a spark. This is not just a story from my past. I see the connection from on the water seat racing to our business lives. Too many organizations do not allow for the best teams. This person has the experience and as such is on the team. Yet is this the “fastest” team? Does this team perform at a level better than other combinations of people? In many cases the answer is no. I have been there and so have you. Ideally we need seat racing in our business lives to differentiate people and to find that spark that leads to the so-called “fastest boat”. A great team can move mountains and so often we fall short of creating the best team. It is not just the overall membership on a team. Seat racing allows a crew to work out the best boat structure (who sits where) and even leadership. In business we find that the same folks fill the same positions on teams. Are we open to a shake-up occasionally and try folks in different roles? To continue with my rowing metaphor – we may be able to get more speed and performance by rearranging the team members and their roles. We do not know unless we try. Just some thoughts on teamwork today – from the water and into the office. Here is a little taste of boat racing along with some honest commentary.